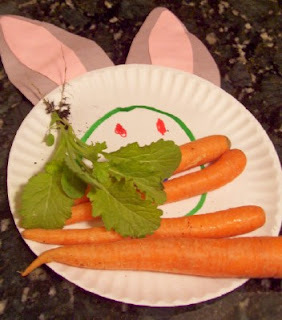 Andrew picked fresh lettuce from his little garden and made this rabbity plate. I can't imagine who buys those plastic-wrapped baskets. Each of ours cost about $2, with half that going to Beatrix Potter chocolate bunnies from Dollar Tree. The rest are recycled eggs from other egg hunts and yard sale goodies. To decrease the candy intake, I filled eggs with LEGO specialty pieces and mini-figs. The LEGOs were free with my Thriftsmart Reward money (spend $10, get a $10 credit). Let me just say, you cannot imagine the excitement we had. 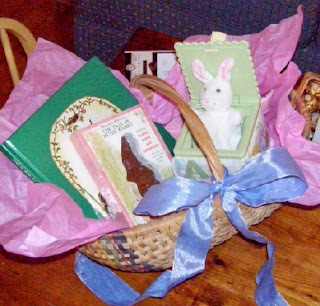 The baby's basket held this yard-sale bunny-in-the-box and a copy of And It Was So: Words From The Scriptures by Tasha Tudor. I think one sheet of tissue paper is easier to deal with than shreds or plastic grass. You have some good ideas for the Easter baskets. As I was finishing baskets last night I thought, "I am NEVER going to use this stupid plastic grass again!!" It just gets everywhere! I like the idea of the tissue paper. And i like the idea, too, of some garage sale/thrift store items. I spent more than I meant to on baskets this year, and you've got a better idea as usual! 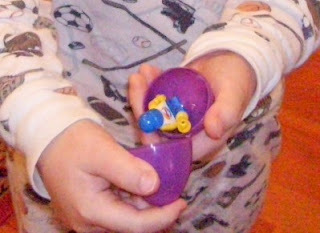 I love the idea of Legos in the eggs! Have to remember that for next year. That's a lovely book for the baby--I have a thrift-shop copy of that one too (but I think yours looks like it's in a bit better shape--mine's pretty ragged). All the baskets look lovely. very good ideas on the baskets. I also do that. This year we just bought each of the kids a few gifts. But for the little ones here, that is a great idea. Too much candy is not good! :) glad you had a wonderful resurrection day. Your blog is encouraging! 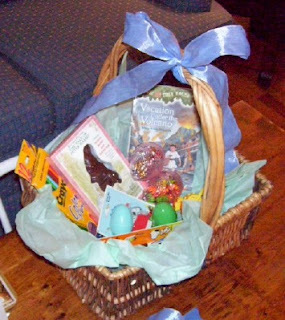 I LOVE how you made the Easter basket!